Cranberry and orange really is a classic flavour combination, the sweetness of the orange works so well with tart cranberries. 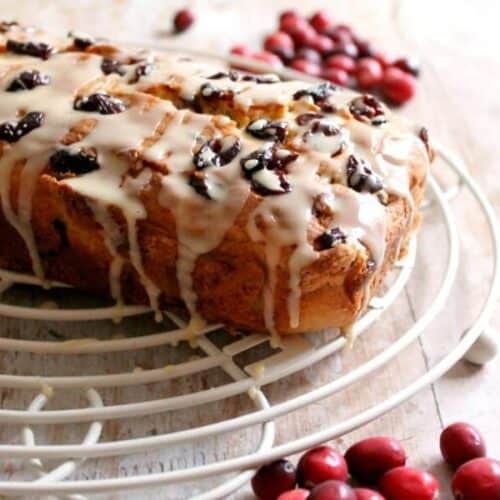 I spotted a bag of dried cranberries in my store cupboard and they gave me the idea to make a cranberry and orange loaf cake, just right for the season. As well as dried cranberries which are great for baking, I also love to cook with fresh cranberries and will be making my cranberry sauce to have at Christmas soon using those, to freeze ready for Christmas Day. Undoubtedly I’ll make it in my slow cooker and I can’t wait for that festive scent to pervade the house all day! To keep this cake from drying out I’ve chosen to make my cranberry and orange loaf a yoghurt cake, with Greek yoghurt in the cake mixture. I used 0% fat Greek yoghurt as that is what I had in the fridge but the normal Greek yoghurt works just as well too. Yoghurt cakes have a lovely springy centre and the Greek yoghurt keeps the cake moist as well as giving it a distinctive flavour, the tang of yoghurt. 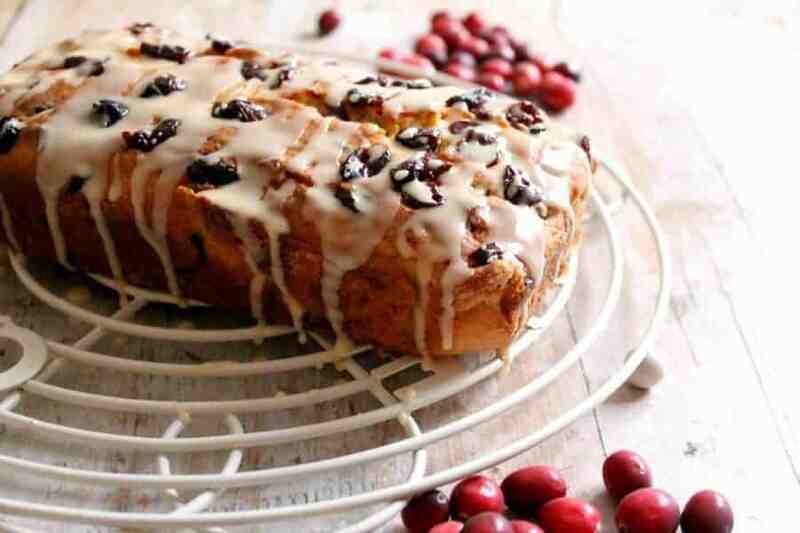 This cranberry and orange loaf cake is adapted from my redcurrant yoghurt loaf cake recipe, to make a winter version of that much more summery cake. 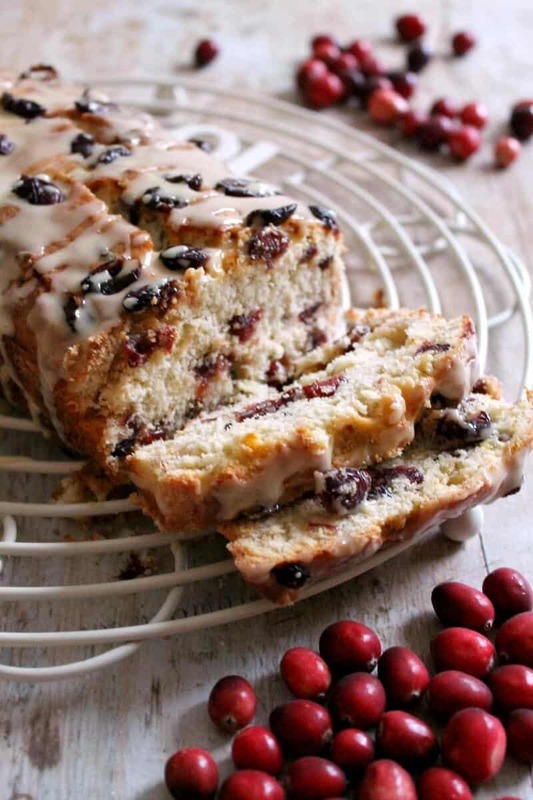 I used orange zest to flavour the cake along with the dried cranberries it is filled with. It always amazes me how much flavour you get just from adding the zest of citrus fruits to cake mixture. For the mulled orange icing I juiced the orange and heated it gently with some added water and a mulled wine spice pouch to give a subtle mulled flavour. I use Steenbergs mulled wine pouches which contain organic cinnamon, orange peel, ginger, clove and allspice. After cooling I then made a simple icing by mixing the mulled juice with icing sugar and drizzled this over the cake. The icing has a subtle orange colour from the fresh orange juice and its sweetness contrasts really well with the cake itself. 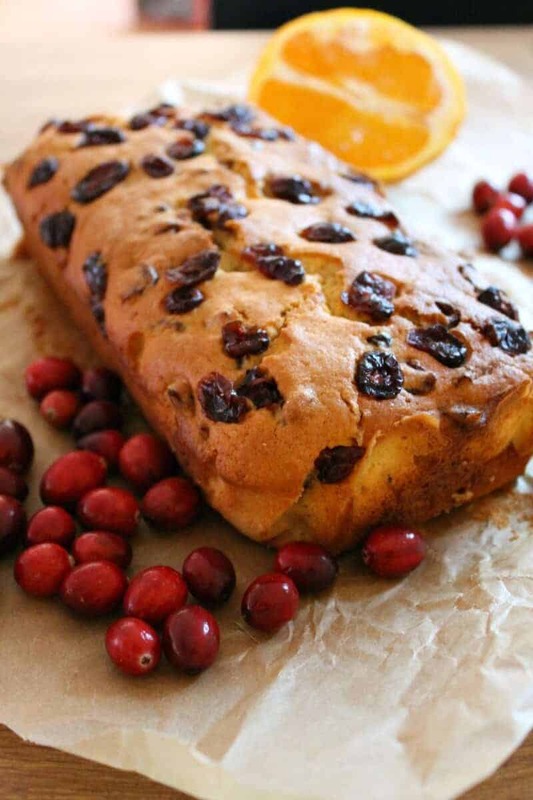 The result is a very festive cranberry and orange loaf perfect for everyday, bake sales, sharing with friends or simple weekend baking! Add the yoghurt, cranberries and orange zest and mix well. Keep back a few cranberries to add on top in the tin. Pour the cake mixture into a 2 lb (1 kg) greased and lined loaf tin. Smooth over then sprinkle the remaining cranberries on top. Bake at 180 degrees for approx. 35-40 minutes or until golden brown and the middle is cooked through (check using a cake tester or skewer). To make the icing, squeeze the orange and heat the juice with a little added water gently with a mulled wine spice pouch for 10 minutes or so or until the juice has been infused with the spices. Leave the juice to cool. Once the juice is cool, mix it with enough icing sugar to make a runny icing to drizzle over the cake. Decorate the cake with drizzles of the orange icing and serve. This cake looks so wonderfully festive. The cranberries look like red jewels and mulled orange icing sounds incredible. Pinned! 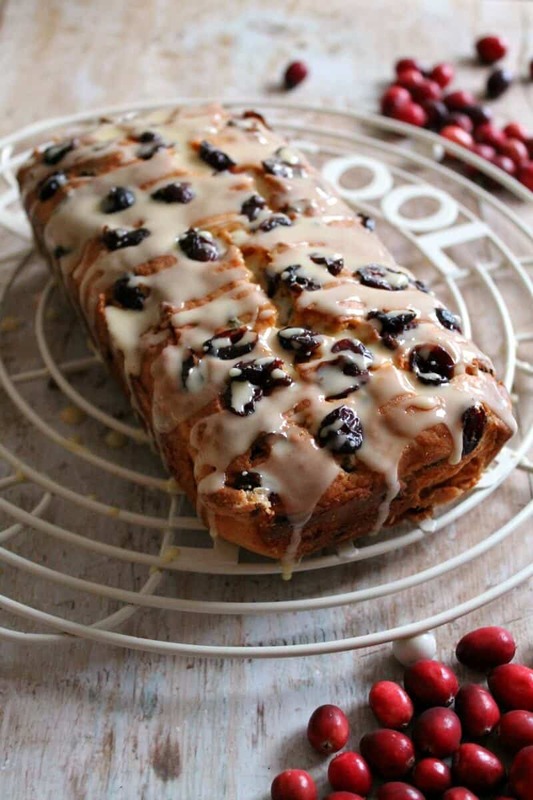 This is such a tasty looking loaf and a great way to use up some dried cranberries! I’ve also got a bag in my cupboard that I’m planning to use soon.